AquaWax™ is a acrylic wax finishing material reminiscent of an old world wax-coated surfaces, including color wax coated walls, both in their look and feel. Simply apply AquaWax™ by cloth, brush or trowel; let dry and buff using a soft dry cloth. AquaWax™ may be tinted with FauxCreme Color™. It is excellent for sophisticated stenciling and can be painted over without removing. Old World Venetian Wax™ is a true wax finishing material that provides excellent surface shine when applied over true Venetian plaster, Marmorino and other lime-based finishes. Simply apply by cloth, brush or trowel; let dry and buff to a high shine using a soft dry cloth. 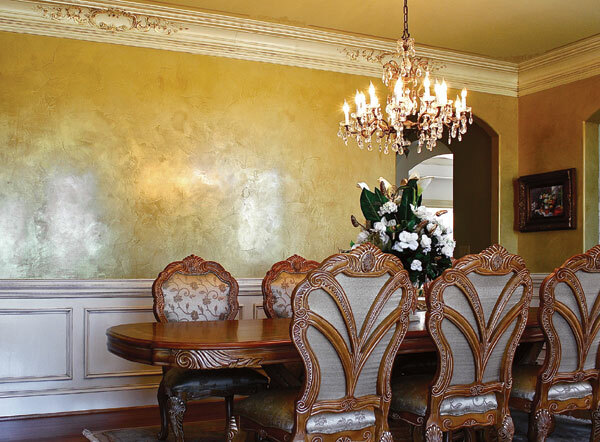 O’Villa® Finishing Wax is a hard wax polymer used to topcoat Olde World Fresco work and O’Villa Finishing Plaster. Gives an Old World waxed wall look. It is a synthetic wax that can be re-coated without stripping. It may be colored with Faux Effects colorants.